ironically, the site is called allgeneralizationsarefalse, yet a chart like that can only be a generalization, and biased in itself. thankfully it comes with an accompanying article. reminds me of the old saying "There's a million ways to divide the world in two halves". 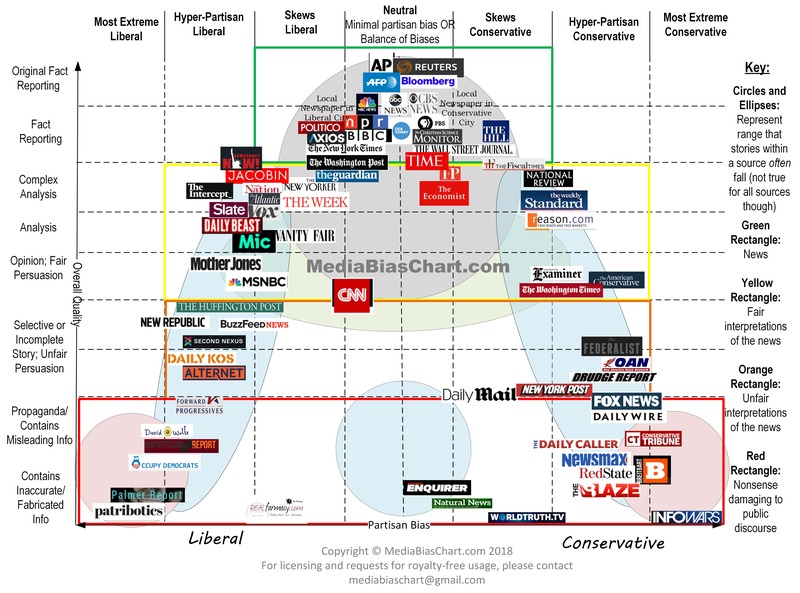 Agree, and there are only English 'news' outlets in the chart. prove their worth by hitting back." ^ well in a very generalised way, i think it's good to listen/watch news from all corners. the chart might help with that (a little). just yesterday i looked up the "trump & children in cages" hype(*) on youtube, and deliberately watched videos that i felt a little aversion to, even fox news and some super- rightwing home dad youtuber rant. it's good to do so, and thankfully most of these youtube articles are very short. (*) yes, there's a hype, but that doesn't mean that the protests are wrong. Like many dystopian articles nowadays. We must stop the habit of assuming that these things somehow automatically apply globally. The USA are neither the largest nor the richest (*) country in the world, and arguably not the most influential either. (*) there are several methods of measuring this, and the USA is top in only one of them. but it's an interesting article. Absurd in the best possible way. I have to read the article later but I tried translating "bar barbar bar bar barbar" from Swedish to English and got nonsens. It does mean "naked savage carried naked savage". So much for machine learning and AI. ^^ Reminds me of Dirty Hungarian Phrasebook. I tried "bar barbar bar bar barbar" from Swedish to English in the opennmt.net project translator and it gave some hints with bar=bar, bära=carry, barbar=barbarian, but did not show anything just "bar bar bar bar bar bar". Deepl is also a good translator, but has a limited number of languages. So far did not find anything better than opennmt.net. The Maori thing seems to have stopped doing it. Maybe they patched something, so you might as well just read the article. It's pretty weird anyway, and some of the things in the linked reddit page still work. and watch the English output pane as the number of oo's increases. "Hit the nail on the head" is perfectly the correct expression. ^ thanks, good to know. Yes saw that and it's pretty funny indeed! The latter only searches StackOverflow atm but even that's useful. ^ do you have some usage examples? when i search for error messages, i learned to strip out special characters (mostly colons ':') because they might get misinterpreted. once or twice i wanted to search for an environment variable that starts with a $, but that would also need to be case sensitive then. beyond that... search for code snippets? in google, you get nothing. with the SymbolHound search, it returns hits on the use of the "." and ".." in cli shells. Yes, I landed on those sites because I was trying (failing) to use a POSIX character class [[:word:]] in a bash regex comparison. Regular search engines come back with things like Microsoft Word. StackOverflow's built-in search is no better. I landed on those sites because I was trying (failing) to use a POSIX character class [[:word:]] in a bash regex comparison. Put a Dr. in front of your name for $20.